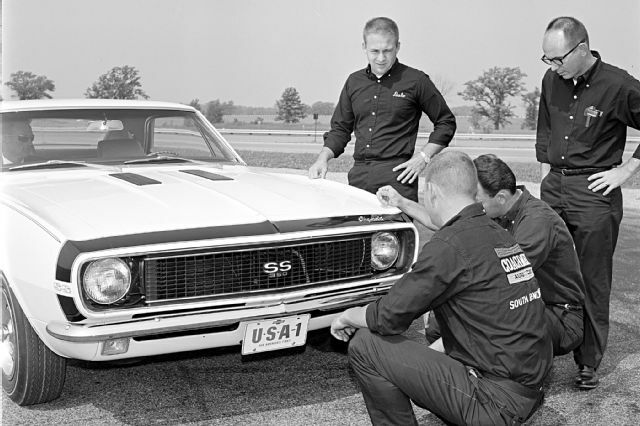 Captured in this picture taken in September 1966, this 1967 Chevrolet Camaro RS/SS350 shows the earliest example of the USA-1 license plate that would grace the front bumper of many Chevys in years to come. The plate shown is the second type with the background painted blue which is correct for the accessory front plate for the "then-new" Camaro. The first type which was a thin aluminum with cardboard backing and gold leaf embossed areas had an older "bowtie" Chevrolet logo and is the rarest example of any of the USA-1 plates. This picture appeared in an article in the April 2019 issue of Super Chevy magazine which can be seen on their website at www.superchevy.com.